The US version is on top; the UK version on the bottom. 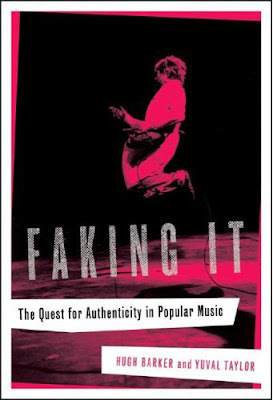 For a book that's about "the ways performers chose, in the course of a song, to comment on themselves" and the ways in which performers are "inordinately interested in proving how real they are," the US version seems far too limited. Kurt Cobain (I think) on the cover, the all-too-predictable punk rock pink -- this just doesn't say "75 years of music history" to me. 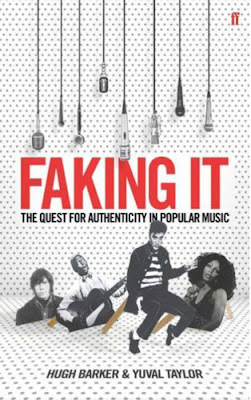 The UK version is trying much harder to reach into music history and to portray the artifice that is the subject of the book -- the flat figures are propped up and the cover as a whole looks like a diorama or sorts. UK:The flat figures and the microphones seem like they are from two different covers. I think the stand-ups say enough. I've got to say that the US cover does more for me, although it is a little obvious and there is something derivative about it. Does it remind anyone else of the Ipod ads? Anyway, the US cover certainly has more verve and swagger for me than the UK version. I found the British edition just a little boring.